Find our complete list of Halloween haunted houses in Washington state for 2018 here at Funtober. We list all the popular haunted attractions including haunted trails, haunted houses, haunted hayrides, haunted corn mazes, and other popular Halloween events. Expect to find Hollywood type set designs, air blasters, live actors, animatronics, and creepy costumes. There are more than a few vampires, zombies, clowns, monsters, and creatures running around these haunt venues. The vampires at haunted houses in Washington state 2018 are always ready to scare visitors to their humble abode. In fact, you might say that they are evergreen, like the state’s nickname, in that they relive the excitement of scaring their first person with every subsequent individual. Care to donate a little blood? Kelso’s “Cinema of Horrors” voted the second “Must See” haunted house in Washington this Halloween season! 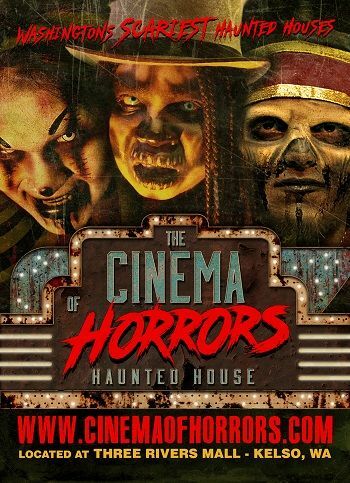 Cinema of Horrors Haunted House, in its third year at Three Rivers Mall in Kelso, WA will return to haunt the old, abandoned Three Rivers Cinema on Friday, October 5th, 2018. According to the Scare Factor, it’s voted the “second must see haunted house in the state of Washington for 2018.” This year’s frightful fun includes two haunted houses, family friendly trick-or-treat nights and more nightly fun! Presented by Treadway Events, KUKN, KLOG & The Wave radio stations, The Cinema of Horrors Haunted House at Three Rivers Mall will be open for thirteen scary nights this Halloween season. October 5-6th, 12-13th & 19-21st and 26-31st. 7:00pm-11:00pm Fridays and Saturdays and 7:00pm-9:30pm Sunday’s and weeknights through – Halloween. Tickets range from $10-$20 and $15 pre-sale tickets are available online now. Their two terrifying, top-notch haunted houses feature new scares, twists and turns! “FarmHouse”, a fan favorite, is in its final season this year. The attraction is voted their most terrifying attraction: A nonstop adrenaline rush inside of Ma’s dusty, demented old murder house where the family enjoys tormenting and enticing their visitors. “Dark Legends of New Orleans,” their newest attraction, offers a blood-curdling, very dark trip back in time to historic New Orleans where voodoo, witchcraft, spirits and more are thought to lurk… The Cinema will offer a wide variety of yummy Halloween-themed fair food and deep-fried goodies. This year’s event features local high school actors from Kelso High, Mark Morris and other nearby schools along with volunteers from local community organizations. 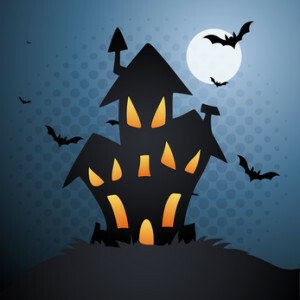 For families wanting a not-so-scary experience, the haunted house will offer “Trick-or-Treat Nights” for families with children under 13 years of age. Children take a trip through the non-scary event and collect candy along the way! These nights take place October 28 & 31st from 4:00pm-6:00pm before the regular attraction opens. Candy bags provided! Attraction opens up on September 29th. A realistic and horrifying show put on as a charity benefit. Tickets are $15. Attraction is open Friday, Saturday, and Sunday nights in October plus a couple other nights near Halloween. This is an all updated haunt at their same location facility. Most of the haunt is indoors. Haunt begins on October 19th. Frightville is located at the Roller Barn and is put on by the Boys and Girls Club of Oak Harbor. The haunt is open on Friday and Saturday nights. Open dates are October 19th, 20th, 26th, 27th, and 31st. Season begins September 21st. Located at the old Georgetown Morgue, The attraction runs Friday and Saturday nights in September and Thursday through Sundays in October. Doors generally open at 7 pm. Check schedule on website for both opening and closing times which vary greatly by day. Admission is $24 but combo options and discounts available. Upon delving deeper into the bowels of the Georgetown Morgue earlier this year, We unearthed a terrifying secret buried far beneath the blood splattered floor boards. Come take a tour and see what our Janitor’s Rigger and Mortis have been hiding all these years. Wonder below at your own risk to see if you can escape the body strewn sewers and private janitorial quarters of the Georgetown Morgue. Sorry folks. They are changing locations and will not be open in 2018. Opens for the season on September 29th. The Haunted Forest is a scary mile long “haunted trail” that supports local community groups in the area. It is held at Royal Arch Park on Friday and Saturday nights in October. It opens at 7 pm and closes at 11 pm. A less scary hour is held 5-6 pm on Saturdays. 6 haunted attractions plus an escape room that is new for 2018. Open Fridays through Sundays from 10/5/18 to 10/28/18 plus Halloween. Begin your journey at The Curse of the Nile, where the Pharaoh awaits his next victim. If you escape from the tomb, continue on to The Ballinger Asylum where theres a cell with your name on it waiting for you. Then take a stroll through The Ballinger Cemetary, and face your greatest fear as you approach the gates of Hell themselves at The Infernum. Next put on your 3D Glasses for the 3D Circus and Clown Town Revival. Be careful, because next you may stumble upon an isolated research station located in the frozen Arctic, where something went terribly wrong! The season begins on October 12th. Runs Friday and Saturday nights in October plus lots more Thursday, Sunday, and Halloween dates. Check their web page or facebook for updates. Tickets are $13. This is an Asylum type haunt so expect to meet some deranged creatures. Join the Hatters on visiting day when they must come face to face with the person they have wrongfully committed or so they thought. As the electronic gate clicks into the locked position behind you and the lights violently flicker off you may find yourself wondering if you’ll be able to make your way back unscathed from the onslaught of Section 12 victims. They are a residential outdoor yard haunt which endeavors to entertain and amuse the public every year with Halloween fun and warmth. Visitors are welcome to walk through the (grave)yard and enjoy the decorations, we also host a cider cart each year, which provides free hot cider to any and all who need a cup of warmth on a cold Halloween night. Mill Creek is located in the Pacific Northwest; a gentle township nestled between Seattle and Everett, Washington. Most decorations come out in early October, but the week preceding Halloween is when we really show the yard haunt. We keep the basic lights on from dusk to 10pm leading up to Halloween. Halloween night, we have everything running, which includes audio and projections. We also serve free hot cider and give out candy to trick-or-treaters. Enjoy this season with opening night on October 5th. A 5000 square foot walk through haunted house. This is the 15th year for the haunted house. My Morbid Mind is opens at 7 pm and closes at 11 pm on the weekends and 10 pm on other nights. Open Friday and Saturdays in October plus lots of Thursdays and Sundays. Check facebook for schedule and details. Tickets are $9 to $15 depending on the date. This “walk with the dead” begins on October 6th. The Jaycees operate the Haunted Forest every Friday and Saturday night in October plus Halloween night. The attraction is open from 7 pm to 11 pm. You can find this haunt at the Sacajawea State Park in Pasco. Admission tickets are $13. The season begins and runs on October 19th, 20th, 26th, 27th and 31st. Scream Fair is house of horrors Halloween haunt. Doors are open from 6:30 pm to 10:30 pm. Will you escape from the Dead Block? When the lights go down and the crowds go home….who is there to hear you scream? Come one! Come all! To the show everyone has been waiting for! Amongst the carnival wagons and midway rides there is a place no one wants to be in the dark, a place where only the brave, or possibly insane, would venture. We see you’ve made it this far so STEP RIGHT UP…You’re welcome to join our circus… but remember you may never go home. Opening night is September 28th. Shadows is new with two scary heart pounding attractions located at the Annex Square Mall. Shadows Dare the Dark Maze and Redemption are both unique attractions. Open nights this year on Friday, and Saturday in October. Tickets are $17 for individual attraction or $25 for the combo option. Frighthouse Station is Tacoma’s longest-running haunted attraction. You are cordially invited to step into two haunted houses – SHADOWS and The REDEMPTION – filled with nightmarish creatures, the shambling dead, the unnatural and unrelenting. Take a moment to forget the nightmares of your life and enjoy the nightmares waiting for you inside – unexpected, waiting, without mercy. Are you ready? If you live in Southern or Eastern Washington, you may want to also consider a few more options on your haunted house search. Have you been to one of these haunted houses? Future readers would be interested in hearing what you thought. Did you have a great experience? Was it worth the money? Would you recommend it to others? Any tips to maximize your experience? I’ll gladly publish what you send me and give you a super dooper hug. Frightville is located in the basement of a 100 year old former dairy barn. An all volunteer staff designs, builds and mans the attraction every year. Every year is a new and fresh start which means that very little is carried over from the previous year. All proceeds from the event are used to support the Boys & Girls Club of Oak Harbor. Hours and dates of operation are posted on our web-site. In addition to the regular hours of operation there will be a special “lights on” matinee for young children and a totally “lights out” event for those who dare! Also, new this year, there will be a costume party and dance in the Roller Barn on the first night of operation for those who want to participate in a Halloween haunting without the scare factor. Check our website for all the details as they develop. This will be our 12th year of operation, and we get better with age. Directions, videos, photos and articles of past events can also be found on our site. Not recommended for children under 12 years of age. Also check out Curfman’s Massive Corn Maze in Toppenish! There is a Haunted Seahawks themed maze that starts on October 7th at 7 pm. There is also a kids corn maze, a straw maze for kids, a pyramid you can climb up and slide down, fire pits, private fire pits, concessions, and a corn pit! Also learn how corn grows and visit the animals in the petting zoo. Admission is $6.50 for kids 4-12 and seniors, and $8.50 for 13+. ALSO follow Curfman’s Massive Corn Maze on Facebook for free ticket giveaway and more! Hope to see you there!